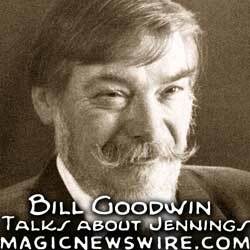 Bill "The Triggerman" Kalush joins us on this episode of the Magic Newswire podcast. Bill founded the Conjuring Arts Research Center in 2003 which has on its' board several significant figures as David Blaine, Steve Cuiffo, Mike Caveney, and Philip Varrichio. Kaulush has been a close friend and associate of David Blaine since they first met in the early 1990's and has consulted with David on almost every television special that he has produced. Bill appeared on "David Blaine : Dive of Death" when he pulled the trigger on the rifle used in Blaine's bullet catch. In addition, Bill was the co-author of the bestselling biography "The Secret Life of Houdini : America's First Super Hero." Harry "The Hat" Anderson is back with us on the Magic Newswire's "Spirit of Magic" podcast to talk about the 75th Anniversary tribute to the Jinx which will accompany the October issue of Genii Magazine. Ted Annemann was one of magic's most influential writers and editors. In 1934 he began publishing the Jinx Magazine with the last of 151 issues being released on December 15th, 1941, just before Annemann committed suicide. Ted was best known for his work in the field of mentalism and many of his methods and routines are still used by performers today. Harry talks about Annemann and how he was influenced by this legendary figure as well as the reason that he feels that the Jinx is still such an important part of our history. Harry "The Hat" Anderson joins us on this edition of the Magic Newswire prior to an upcoming appearance at the SEAM conventionin Atlanta. He is best known by many for playing the role of Judge Harry Stone on the television series Night Court. In addition to eight appearances on Saturday Night Live between 1981 and 1985, Anderson had a recurring guest role as con man "Harry the Hat" on Cheers. Harry has toured extensively as a magician and continues to present his evening show "Wise Guy" which was originally developed for his theater in New Orleans. Eric Eswin first discovered magic at the knee of an uncle showing him a coin trick. Today he is the International President of Fédération Internationale des Sociétés Magiques (International Federation of Magic Societies or FISM) which now consists of 82 clubs, both national and international, as well as national Federations which represent over 50,000 Magicians from 44 countries. Having just returned from the most recent World Championship of Magic in Beijing, Eric joins us on the "Spirit of Magic" podcast to talk about his vision for the future of the organization and some of the controversies related to the next convention in 2012. Paul Diamond may not be a household name in the world of magic today, but everyone that I speak to from Johnny Thompson, to Mac King & Lance Burton, etc... all know Mr. Humble. I was lucky enough to get my first exposure to magic through Paul's shop when I was ten years old. As it turns out, Paul was also a favorite performer of Frank Sinatra and the Rat Pack. Over the years, he's been a featured entertainer for celebrity events hosted by Celine Dion, Elton John, Milton Burle and others. In addition, Paul had such legends as Slydini and Charlie Miller live with him in his Florida home. 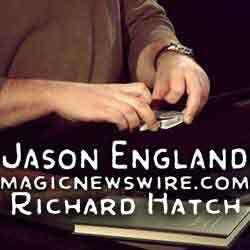 Rediscover "Mr. Humble," Mr. Paul Diamond on this episode of the Magic Newswire's "Spirit of Magic Podcast." I recently received an amazing email from Bill Smith offering to share a previously unheard interview with Harry Blackstone Jr. Obviously, I was flattered and thrilled that I could share this with our listeners. According to the information shared by Bill, this interview was recorded by a local radio station in Texas, but was never broadcast. Fortunately, Bill was able to obtain the master and we now have the digital copy that we are sharing here today. Thanks again to Bill who has said that he will welcome any emails inquiring about this chat. It is a WONDERFUL interview, with Harry doing 99% of the talking. It runs about 15 minutes if i remember right, & starts off with him talking about how his dad got started, became famous, & leads silk smooth into how his dad helped him get going, & him becoming famous. I know i could SELL copies of this, but i also know that as soon as i did, it would be all over the net for free anyway, so i'd rather use it to give back to this great art, & also to thank you for the great job you are doing preserving the knowledge of all those greats of magic through your podcasts. My guest on this episode of the Magic Newswire's Spirit of Magic podcast is Magic Castle regular Rob Zabrecky. Rob began not as a magician but as a musician as a part of the 90's indie band Possum Dixon. Discovering magic after an unexpected visit to a magic shop while on tour, Rob became addicted to magic and mentalism. Rob is now a frequent performer in the Parlor of Prestidigitation and was a long time host of the AMA's "Who's Hoo" interview series.